It's been quite a while since you last heard from us. But we can assure you that the time was well worth the wait, as we’re finally able to show you our two next projects: XR VR and X4. For an exclusive first presentation of X4 we would like to invite you to the EGOSOFT HQ, where you will be among the first getting impressions about our next big project. Additionally, you will be able to try out our newest iteration of the X-Universe, our first Virtual Reality game, which just started into its Early Access phase: the X Rebirth VR Edition. There’s only a month left to the Gamescom (22th to 26th August 2017), in Cologne, Germany. While this is usually the time and place to present new games, we thought about doing it a bit differently this year by reviving an almost forgotten event, some of our longterm fans may remember as the XCon. Last held in 2004, shortly after the release of X2: The Threat, the X-Convention (short: XCon) is an event to meet the Egosoft Crew in their natural habitat, the Egosoft HQ, and learn about the newest developments in the X-Universe. You can get some impressions from the XCon 2004 here and here. Registration ends August 13th 2017. After this date we will inform you if you got a seat and send all the necessary information to find us. We hope to meet many of those who we only know by their forum nicknames and are eager to show and discuss with you the history, present and future of the X-Universe. If you’re a member of the press and would like to attend the presentation of X4 and the XR VR Edition at the Egosoft office (26th/27th August 2017) or would like to schedule a private meeting with us at the Gamescom (23rd to 25th), please get in contact with us via email at press@egosoft.com. PS: For those of you who will not be able to attend, we hope to be able to stream at least a part of the event online. Please understand that as the plans are not finalised yet, we cannot share any more details at the moment. In any way, you will of course read about the XCon 2017 in the next edition of the X-Universe News. Today Egosoft is pleased to announce the early access release of its first Virtual Reality game: the X Rebirth VR Edition. The X Rebirth VR Edition is a new standalone game based on X Rebirth: Home of Light, completely redesigned and optimised for a Virtual Reality experience. Utilizing the latest advancement in VR technology with the Oculus Rift and Touch as well as the HTC Vive, the XR VR edition lets you experience space like you never did before. Experience a fully simulated economy in a huge universe – While based on X Rebirth: Home of Light, the universe and economy of the X Rebirth VR Edition are specially designed for a Virtual reality experience. This is also the reason why the games are not savegame compatible. 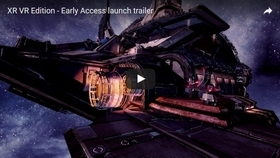 New graphics engine - The X Rebirth VR Edition will be the first title by Egosoft to utilise our new in-house developed engine, based on the innovative new Vulkan technology. Take on a large variety of missions - Play as a freelancer, a pirate, a trader or search for your own adventures. Missions revolving around all aspects of the game will help you to find your way. Pace and Balancing - All aspects of the game had to be rebalanced to create the best experience for the VR environment. 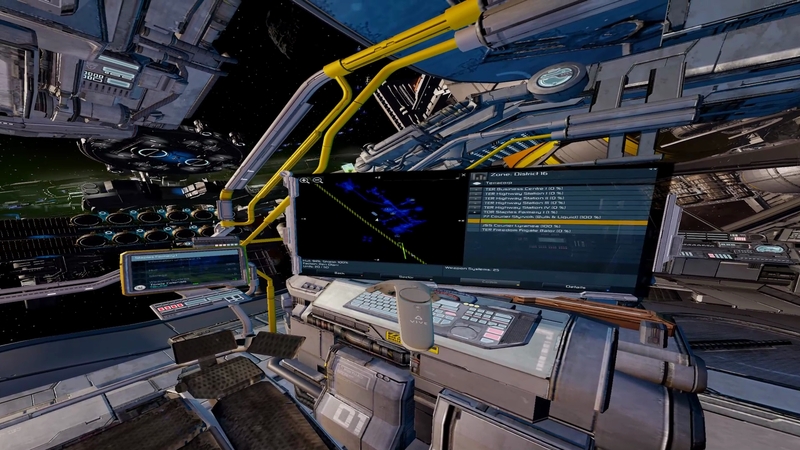 Switch between 3D and 2D mode on the fly - The user interface of the XR VR Edition was specially designed to work entirely in an immersive first person VR cockpit experience and makes full use of Oculus Touch and Vive Controllers. However, if you feel like it, you can switch to your monitor and favourite input devices at any time. Endless possibilites - Build your own ships and create an armada to fight your enemies or dominate the market with your factories and trade ships. You decide how you want to play. TRADE, FIGHT, BUILD, THINK in the X Universe – the biggest sandbox this side of the galaxy. 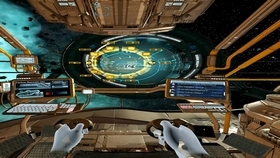 The VR controller based UI: the XR VR Edition has an exciting new method to control the game. The HTC Vive or Oculus Touch controller can be used to point at UI elements and interact directly with the cockpit. We are looking forward to receive feedback by customers on the quality of this experience and improve it further before the official public release. The new Vulkan-based high performance graphics engine is still relatively early in development. This engine is designed particularly for our next big project: X4. The Early Access phase of XR VR Edition allows us to test this new technology on a wide range of different hardware. To participate in the development process of the VR Edition please subscribe to the EGOSOFT forum and visit the XR VR Edition forum. This will be the place to report bugs, make suggestions for the game and get updates about our future plans. We will also try to post on the Steam forums, but cannot provide the same level of service there. From now on the XR VR Edition Early Access version is available from the Oculus Store supporting Oculus Rift and Touch and from Steam supporting the HTC Vive for a reduced early access price of 39.99 € or 39.99 USD respectively. If you have further questions about the XR VR Edition and its early access phase, please visit our dedicated FAQ.